Kick'n Bass®, R-Scientific Enterprises, LLC. 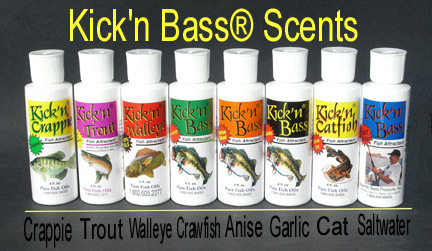 Powerful fish attractants and scents. NEW NEW NEW- "Triple Threat" Scent Packs NOW available online for Limited Time ONLY! Rod Covers in a WIDE variety of School Colors. Developed with a tighter compression fabric and hook resistant coating! Visit the website to see the colors and sizes available. Contact us for other colors. We are adding new ones frequently! Please bear with us. Site STILL under renovation. We do not want to minimize 18 years worth of reports and articles so we will keep them active on our "Archives Home Page". Strongest fish attractants in the world! For over 18 years we have lead the industry with the best products that Science can conceive! Created by a Cosmetic Chemist our formulas are made of concentrated fish-oils. They are not WATER BASED CHEAP FORMULAS ! They work. They catch fish ! For years they have been proven effective and that is one reason why we do not want to delete all our past reports and experiences. 1-800-605-BASS toll free ordering and Credit Card. without the written consent of R-Scientific Enterpirses, LLC. DBA: Kick'n Bass®. Send mail to kicknbassattractants@yahoo.com with questions or comments about this web site. Copyright © 1997 Scientific Bass Products, Inc.
Last modified: November 28, 2014 .